The latest in a series of bans aimed at tourists comes from Venice Mayor Luigi Brugnaro, who has proposed a fine of up to €500 for sitting down in undesignated spots throughout the city. According to CNN Travel, the Venice city council is currently discussing the text of the proposed ban. There is already a ban in place preventing people from sitting down in St. Mark’s Square and on the Rialto Bridge. Brugnaro’s proposal corresponds with other measures the city has taken to combat overtourism and curtail tourists’ bad behavior, and is part of the #EnjoyRespectVenezia campaign, which aims to communicate that tourists are welcome so long as they respect the city and its residents. Besides overcrowding, Venice and other popular cities in Italy are also dealing with littering and graffiti. Venice already prohibits people from feeding pigeons, walking around in swimsuits, loitering on bridges, bicycling, littering, and putting padlocks on monuments. Other cities in Italy have also recently implemented similar bans with steep fines. Florence passed a measure preventing people from eating in the streets, with a 500€ fine, and began hosing down the steps of churches during lunchtime to discourage people from sitting and eating there, while Rome also banned eating on or around fountains and monuments. Sardinia announced that it will fine people who steal sand from the island’s pristine beaches up to 3,000€. In Venice, the 20 million tourists who visit each year overwhelm and outnumber the city’s 55,000 permanent residents. 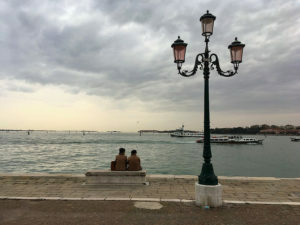 Venice has been experimenting with sustainable tourism initiatives to make daily life more bearable for residents, including implementing separate vaporetto queues for locals and tourists, banning large cruise ships and small recreational watercraft from the lagoon, and restricting tourist access during the May Day holiday weekend.